Sons and daughters of the three Abrahamic faiths came together to share prayers, songs and fellowship at a Thanksgiving service in Brooklyn Sunday afternoon. Catholic, Jewish and Muslim members of the Interfaith Coalition of Brooklyn organize the annual event, now in its 18th year, at Our Lady of Refuge Church in Flatbush/Ditmas Park. It was a chance for neighbors to come together in a show of unity and mutual support, particularly in a political climate so hostile to immigrants and in light of recent anti-Semitic attacks and vandalism. “Our country has been torn apart politically with hatred toward immigrants, hatred toward Jews, hatred toward Muslims,” said Sister Celia Deutsch, N.D.S., from Our Lady of Refuge, who devotes much of her time to interfaith relations. “For me, this gathering is a sign of hope in a very grim atmosphere,” she said, pointing to immigration detention centers, the Pittsburgh synagogue massacre and the racially fueled shooting of two African-Americans at a Kentucky supermarket. Looking at the children running around, hearing the crowd sing “This Land Is Your Land,” and then seeing everyone – Jewish, Catholic and Muslim alike – chatting and laughing over cups of coffee were signs of hope and promise for the future. “This is who we are – all of us together – whether we’ve got papers or not, whether we’re citizens or not, this is who we are; this is our church,” Sister Celia said. “There’s a lot of work for us to do … For me, the work is about coming together and learning to speak to one another respectfully, even with people who have different understandings of what it means to be an American. In that, we learn to discover God in new ways – a God who is bigger and even more loving than we thought,” she said. Learning workshops and communal Passover and Iftar dinners are other ways the interfaith coalition has encouraged the three groups to discover God in each other. Personal friendships have also been formed: A Muslim family invited Rabbi Heidi Hoover of Brooklyn’s B’ShERT synagogue to their home for Iftar, the evening meal Muslims share to break their daily fast during their holy month of Ramadan. And Rabbi Hoover plans to have the family come to her home for Passover next year so that she may share her holy day and festive seder meal with them. In their friendship, she has come to know them and learn their plight as refugees, growing in understanding of the conditions that forced them to leave Turkey. “There is a realness in knowing people who are refugees – these aren’t people in a caravan – but they’re no less refugees; they had to flee their country,” she said. Getting to know each other, sharing stories and building bonds in times of peace, said Rabbi Hoover, means that when there is a crisis, they are there for each other. She felt a sense of “solidarity and support,” she said, at the vigil she held at her synagogue following the shooting in Pittsburg. When she looked into the congregation, she was heartened to see her Christian and Muslim friends praying with and for her people. Mutual respect, borne of faith in God, is the unifying thread that empowers the communities to view and treat each other as sisters and brothers. A representative of the Turkish Cultural Center in Sheepshead Bay, who moved to Brooklyn two years ago, said she has found true friendship among the Jewish and Christian communities here. “Everybody is so respectful. I thank God for this. I’m not in my country, but I feel this is more than my country. I’m not with my family, but these people feel like my family,” said the young mother, who hosted Rabbi Hoover at her home for Iftar. “So we can hold hands and pray together, and it doesn’t matter the language or who is singing, we understand what the other person is feeling. This is what makes me thankful for being here,” she said. Her husband offered one of the reflections during the prayer service. There have been an upsurge of arrests and imprisonments in Turkey, and he spoke of the deplorable conditions facing young mothers and their babies in jails. “Add the innocent people’s tears to your prayers,” he asked the faithful, and reminded them of the words in St. Luke’s Gospel, Chapter 17, which states that the Kingdom of God is among the people. “People have the power to create hope, the power to create peace, the power to create happiness,” he said. Reflections, prayers and songs were offered among the multicultural congregation in English, Spanish, Haitian Kreyol, Turkish and Hebrew. 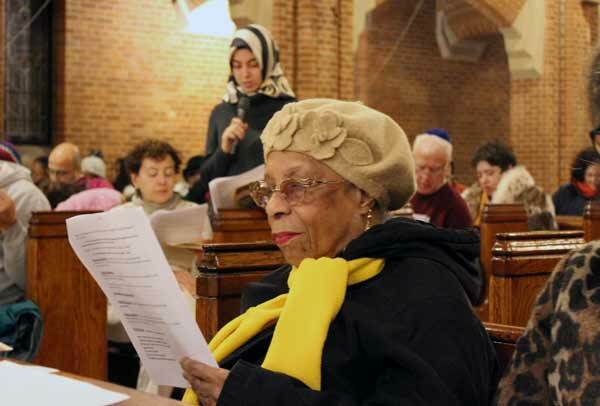 Founded by members of Our Lady of Refuge and the East Midwood Jewish Center, the Thanksgiving service and interfaith coalition have grown in recent years to include the Jewish community of B’ShERT in Prospect Park South, and the Muslim community of the Turkish Cultural Center based in Sheepshead Bay. 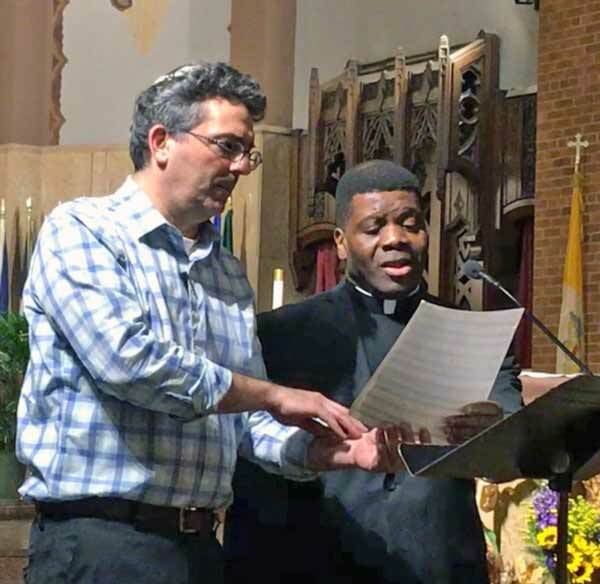 Father Saint Charles Borno and Cantor Sam Levine sing the benediction. Father Saint Charles Borno, who became pastor of Our Lady of Refuge in July, was attending this prayer service for the first time. The level of participation impressed him. “It is a testimony of how much work has been done here throughout the years,” he said. Given the state of the world today, he said, it is important to remember that there is a Higher Power who can heal the hatred, divisions and violence that prevail. But the faithful must do their part as well. Blessings also arrived by the bagful as attendees brought donations for the parish food pantry. Lafortune has been coming to the annual prayer service since he was 10 years old. This was his 16th year. Thanks for providing us with this inspiring gathering. Breaking bread together is a wonderful way to realize our place in God’s creation and our bond as brothers and sisters, all made in God’s image.